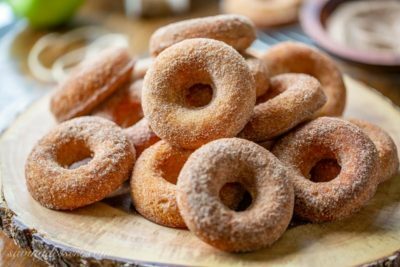 Baked Apple Cider Doughnuts – I can’t wait for you to try this recipe! 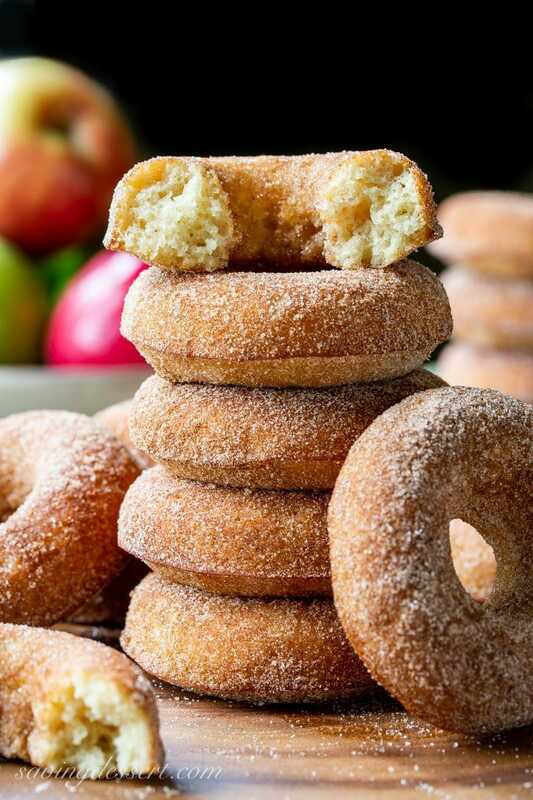 Our light and spongy cinnamon sugar coated Apple Cider Doughnuts are so delicious, bet you can’t eat just one! Apple cider is pretty amazing stuff. Whether adding to sweet or savory recipes, it’s a must have for fall cooking and baking. During apple season, most grocery stores carry fresh apple cider so be on the lookout for this magic elixir in the produce section. When you boil down the cider for this recipe, your house will smell amazing! Be sure to watch it closely as you don’t want it to boil over onto your stove. I’m not a fan of yeasty, fried doughnuts and am grateful there’s something in this world I don’t like to eat! However, I do love a good baked doughnut and these Apple Cider Doughnuts are some of the best I’ve ever had. 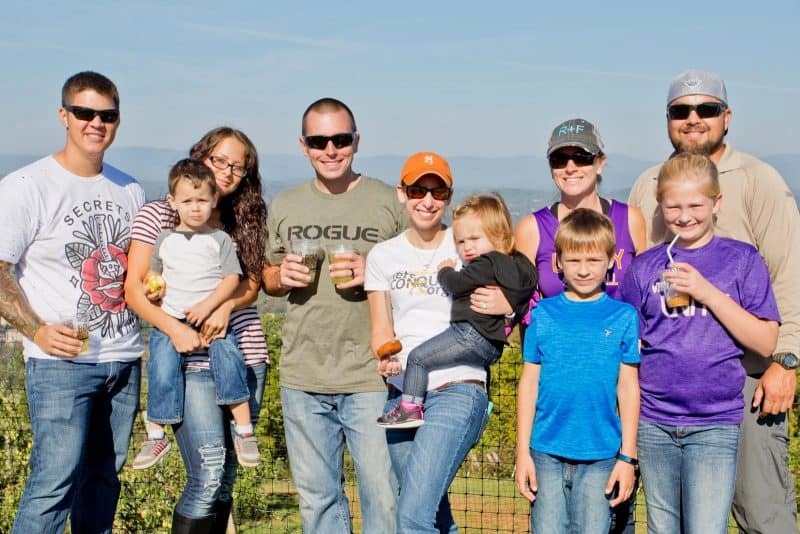 Each year we take a quick trip to Charlottesville Virginia, which is about an hour away, to pick apples at Carter Mountain Orchard. They have pre-picked or pick-your-own apples in several varieties. 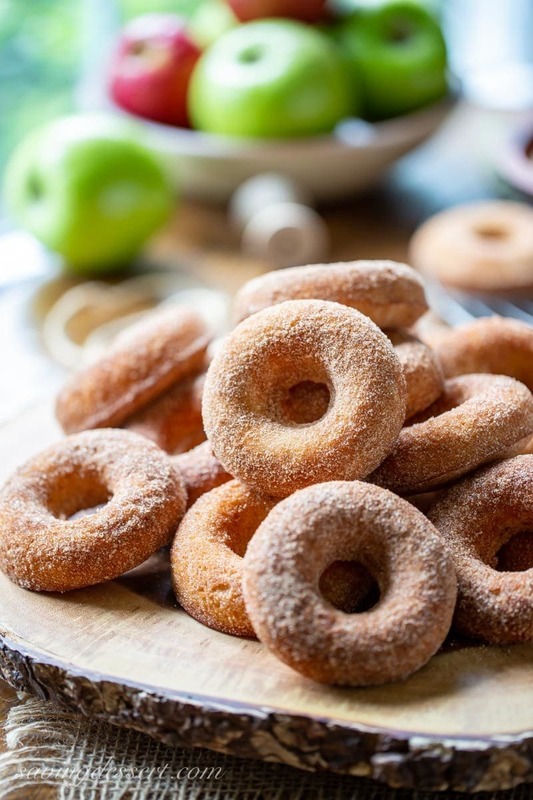 They also have a restaurant, a hard cider cellar, country store and bakery where they sell jams, cider, pies, ice cream, and the unbelievably popular fried apple cider doughnuts. My son and daughter-in-law never leave the mountain without a box of their doughnuts. Since I don’t care for fried doughnuts, I’ve never actually had one but I do like a bottle of hard cider, after I’ve picked apples of course. They host special events and are extremely busy during apple season. If you live in the area and want to visit, check their Facebook page before heading out to see if they’re closed due to overcrowding. The popularity of their doughnuts prompted me to come up with my own recipe for a baked version of these treats. I passed along a box of these homemade baked apple cider doughnuts to my son and daughter-in-law (center) and received a big thumbs up from his whole family. I bet they’ll still buy doughnuts from Carter Mountain, but that’s okay. Whenever we can’t make the trip to the mountain, we an always have my delicious homemade fresh Apple Cider Doughnuts! In a pinch you can use plain, unreduced apple cider in this recipe but the flavor will not be as intense. I would not substitute apple juice as it has added sugar which is not needed in this recipe. You can drizzle icing on the doughnuts instead of coating in cinnamon and sugar if preferred. 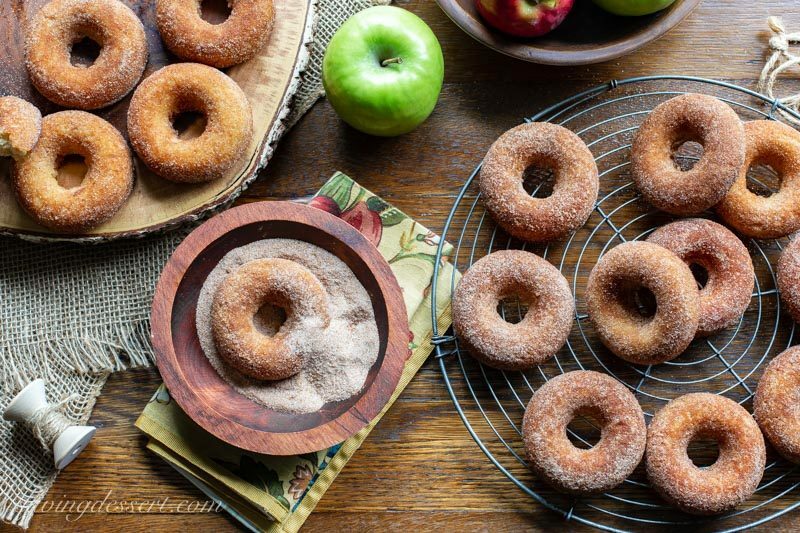 Skip brushing the apple cider on the warm doughnuts and allow them to cool. Whisk together a tablespoon of cider with 1/2 cup of powdered sugar and drizzle on the cooled doughnuts. I use a 6-well doughnut pan so I bake in three batches. If reusing the pan as I have done, wipe it out with a paper towel and re-coat with vegetable cooking spray between bakes. If you don’t have a doughnut pan and don’t want to buy one, make muffins instead! You should get 12 muffins from this recipe. Bake about 23-25 minutes or until a toothpick inserted in the center of a muffin comes out clean. 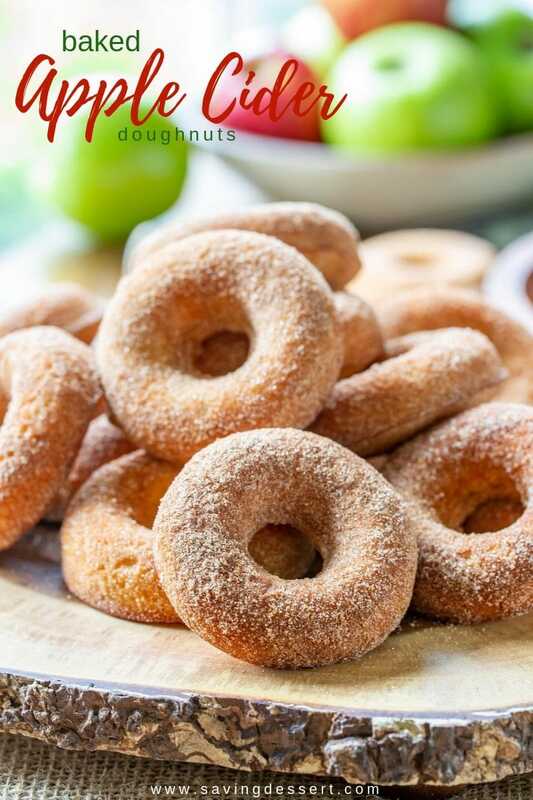 These doughnuts have a deliciously light and spongy texture and nice bite from the apple cider. They are terrific warm, or room temperature and are best eaten the day they’re made. They become a little moist, but not wet, from the sugar coating after sitting overnight but are still delicious to eat. Donut or Doughnut? Check out this fun and interesting article from Huffington Post about the spelling debate and a possible history behind the origin of the word donut. Apple cider is not the same as apple juice. It’s typically raw, unprocessed, unfiltered and unsweetened juice made from just apples. Natural apple cider is made by grinding and seriously pressing the apples to extract the juice and some of the pulp. The apple pulp (almost like apple sauce) is then strained and the remaining juice/cider is bottled. That’s the simple, abbreviated version of the process but of course there are a few more steps I might have skipped. When cider is boiled and reduced, it produces an intense apple flavor you will enjoy! Boiled cider is typically made by reducing apple cider to one fourth it’s original volume. You can boil four cups of cider down to one cup to achieve this ratio. For this recipe we boiled the cider to only half it’s original amount. The more you reduce the cider the more intense the flavor will become. It also thickens to a syrup or molasses consistency. Apple cider is a non-alcoholic beverage not to be confused with hard cider. Hard cider is pretty great, but probably not for baking doughnuts. Some apple ciders are pasteurized which will extend the shelf life but also mildly affects the sweetness of the cider. Pasteurized cider will work fine in this recipe because we’re cooking it down anyway – no worries. Let’s be baking friends! If you try our recipe please feel free to leave a comment on this post. I’m sure your experience and insights will help all our readers, and me too. Also, if you’re on Pinterest feel free to leave a comment and photo there if you have one! If you share on INSTAGRAM use the hashtag #savingroomfordessert so we can stop by and give your post some love. And we’d be very happy if you’d FOLLOW Saving Room for Dessert on FACEBOOK| INSTAGRAM| PINTEREST | TWITTER and subscribe to our YOUTUBE channel for all the latest recipes, videos and updates. Thank you!!! Chocolate Doughnuts – If by chance you really need a chocolate donut, these will absolutely, without a doubt, completely and totally satisfy your craving! They are like mini-baked cakes with all the trimmings. Nope … these donuts are not good breakfast food. Stick with your oatmeal or protein packed smoothie and save these for dessert! 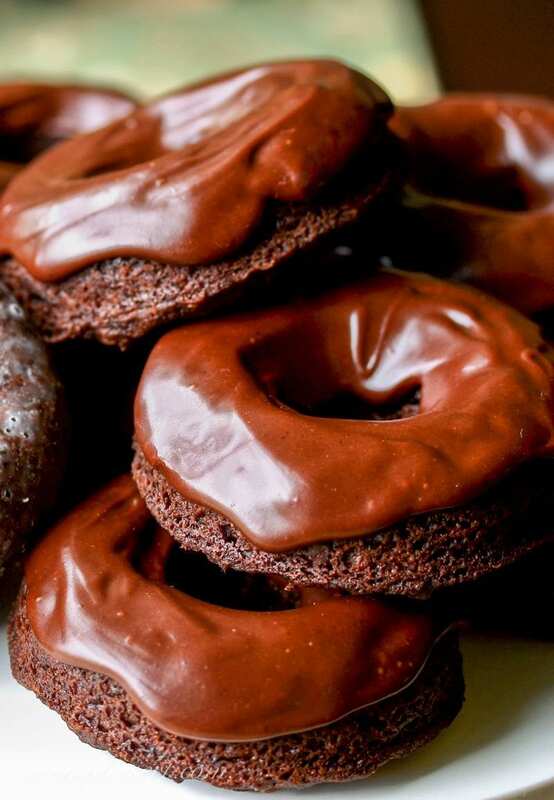 Click HERE to get the recipe for Chocolate Doughnuts. I hope you’ll try these lovely baked Pumpkin Doughnuts with Caramel Icing & Toasted Pecans. They have a wonderful texture and terrific flavor. Topped with caramel icing and toasted chopped pecans – they’re easy to make but hard to stop eating! 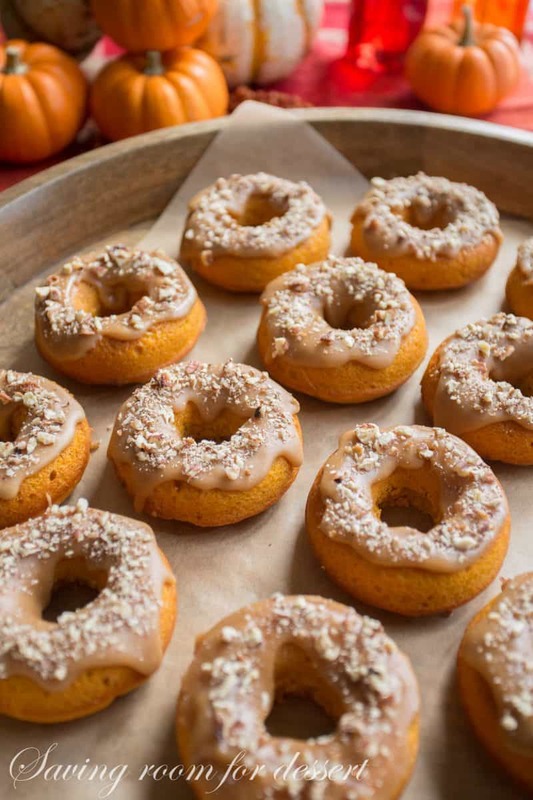 Click HERE to get the recipe for Baked Pumpkin Doughnuts. Bet you can't eat just one of these light and spongy cinnamon and sugar coated Apple Cider Doughnuts! Lightly grease a donut pan with vegetable cooking spray. Set aside. Place a cooling rack over a piece of parchment, wax paper or set it inside a large baking sheet. In a small bowl whisk together the cinnamon, salt, baking powder and flour. In a medium mixing bowl combine the oil, eggs, sugar, apple sauce, 1/2 cup of the reduced apple cider and vanilla. Whisk until smooth and well blended. Add the flour mixture and blend with a spatula until smooth, with a few small lumps, do not over-beat. Fill each doughnut pan well with 1/4 cup of batter. They should be almost full. Bake for 14-16 minutes. While the doughnuts are baking, mix together the cinnamon and sugar for the topping in a small bowl. Check for doneness by inserting a toothpick into the center. It should come out clean. Allow the donuts to rest in the pan for 2-3 minutes then remove to a wire rack. 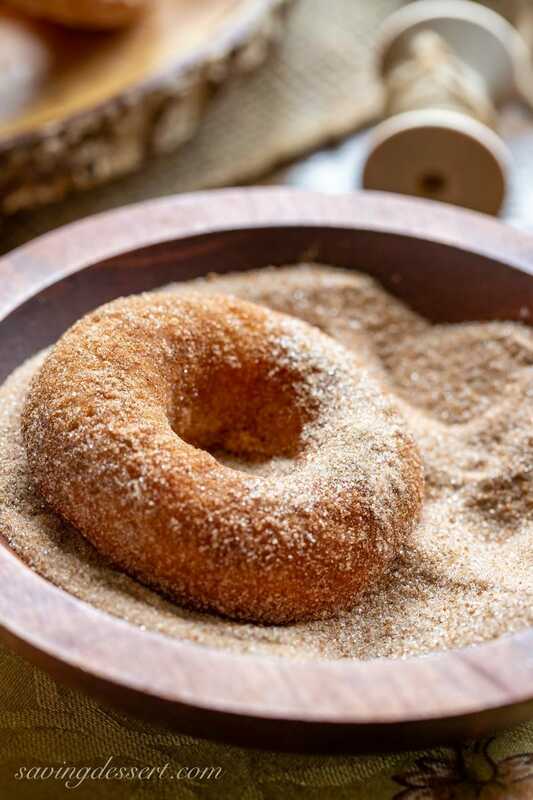 Brush the warm donuts with the remaining 1/2 cup of reduced cider, then toss in the cinnamon sugar mixture to coat. Return the doughnuts to the wire rack to set, or eat warm and enjoy! Before baking the next batch of doughnuts, wipe out and respray the pan for easy removal. Be sure to re-spray your doughnut pan in between batches for easy removal. PRO TIP: Here’s an easy tip for knowing when the apple cider is reduced to one cup. Pour 1-cup of the cider into the saucepan. Place a wooden skewer straight down into the pan and mark how far up the skewer the cider comes. Add the remaining cider to the saucepan and cook as directed. Once reduced you can test by placing the wooden skewer into the pan. If it comes to the same level as marked on the skewer, it's reduced enough for this recipe. If reduced too much, it’s okay, just add more fresh apple cider to make one cup. To make muffins instead of doughnuts, fill each muffin well until about 3/4 full and bake for 23-24 minutes or until a toothpick comes out clean. Makes 18 doughnuts. Apple cider is a wonderful, seasonal favorite in our house. I tend to bake and cook with it more than drinking it from a glass. If you love apple cider too, check out our recipe for Chicken Fricassee with Apples for a wonderful savory spin on cider. Sue from The View from Great Island knocked it out of the park with this Apple Cider Doughnut Cake. Have you tried it yet? Check out this Apple Cider Mimosa Recipe from Becky at The Cookie Rookie. What a great brunch idea! And finally, don’t miss this post for make your own Slow Cooker Apple Cider from Melissa at Bless this Mess – so easy! Hi Tricia, My donuts are in the oven baking but I did have some questions maybe for the next time I bake these. I was afraid to over mix my batter which seemed quite liquidy. Using a rubber spatula I developed small to rather large lumps (like walnut sized). I squished some of them on the side of my bowl with the spatula but as I said, I was afraid (always on the first round of a new recipe). So pouring my batter with a 1/4 cup into each donut slot, there were the large lumps, too! Don’t know how this will turn out but can you tell me if I did anything wrong so far? Thanks! Hi Dawn – I don’t think you did anything wrong at all – maybe just smush the lumps a little more next time. Hope they turned out for you! They are really delicious and unique. Hi Tricia, Thanks for getting back to me. Well, I am amazed by your donut recipe! You are so right that they are delicious. I can’t, of course, eat them all to see what happened to those lumps, but so far, I haven’t noticed any! Odd how that happens but I will take your advice and smush the larger ones a bit next time…even though. Hahaha. I wish I could send you a picture of what they looked like cooling on a rack but don’t know how to do that. Again, thanks for your advice! Amazing !! I love a great donut and baked is even better! Great post !! Can’t wait to try this recipe, thanks Tricia! Thank you Anna – you’re so sweet! Apple cider doughnuts? Why haven’t I had these! Terrific idea — and what a super recipe. I do like fried doughnuts, but they’re such a pain to make. Your baked version is much, much better. Healthier too. Thanks! You’re going to love them John. They’re such a great Autumn treat – especially the baked ones 🙂 Have a lovely week and thanks. Woo hoo, Tricia! Your doughnuts look awesome! The farmers’ market we go to started making apple cider doughnuts a couple of weeks ago. There’s always a long line for them and no one minds waiting while they make them. Like that yours are baked. Thanks for sharing! Thanks Pam – you won’t have to stand in line if you make these at home – so good! They look delicious Tricia. While in Door County, WI, the ladies made several trips to Wood Orchards to buy their cider donuts so I’ll be sure Bev sees this. Thanks Larry – these have all the great apple cider flavor without being deep fried. We love them! These beautiful donuts are calling my name! I love that you’ve come up with a baked version. Sadly, I love the fried ones as well but these would be so much healthier (everything is relative, right?). You bet Chris – thanks! These Donuts look great! Amazing recipe. I do believe I see a doughnut (loved the article) baking pan in my future! I know my store will have apple cider soon (if not already) and I’d love to make these 🙂 The crumb looks moist and delicious and I can already imagine how tasty they are! Doughnut Sundays in the fall? Sounds good to me! Be sure to try one warm from the oven Susan – they’re just delicious! This is a great weekend baking project and it’s easy too. Enjoy and thank you so much! I’ll take a dozen, do you deliver?? For you … yes I do! Tricia: You have gone too far this time! The recipe is printing out right now. I cannot wait!! Thank you!! Thanks so much Bonnie – and I’m sorry? Maybe just a little 🙂 Enjoy! Hope you are doing great – it’s terrific to hear from you. Great apple flavor going on here Jennifer – thank you and enjoy your amazing apple season! They look sensational coated with cinnamon sugar plus they are super adorable!